I can’t remember how I stumbled upon this pattern, but it was love at first sight. I’m one of those people who thinks the majority of crocheted things lean toward ugly, so this pattern really blew my mind. 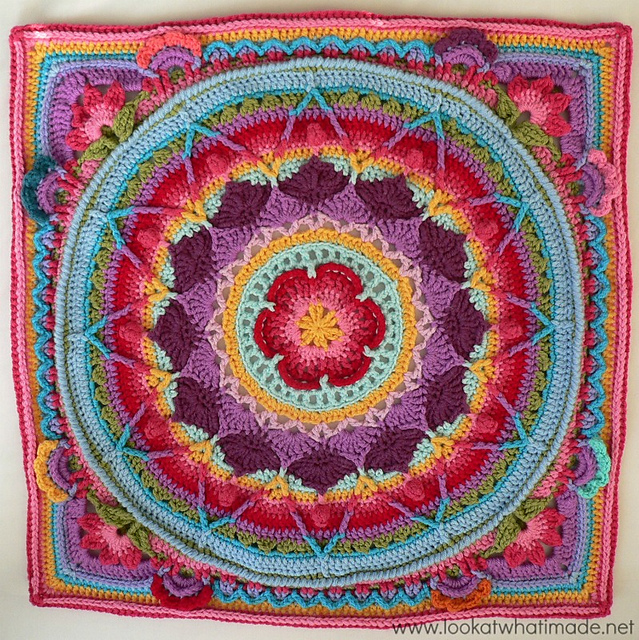 Sophie’s Garden started off as just the circle part…Sophie’s Mandala. Then after it squared up into a “garden” the designer kept going until she had “Sophie’s Universe“…a blanket up to 6′ square. 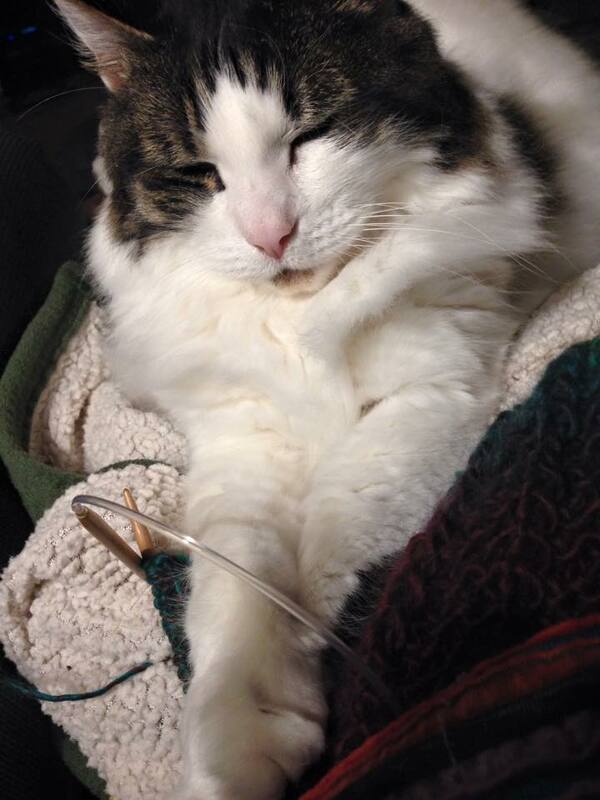 There’s a CAL (Crochet-Along) happening right now and I’m doing it as best I can. 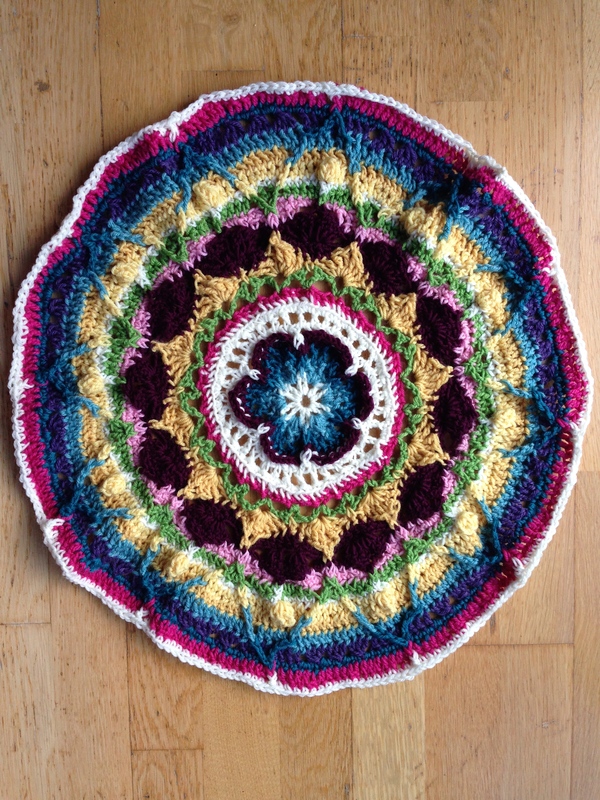 Sophie’s Mandala with ten different colors of Cascade 220 superwash yarn. If you’d like to try crocheting this yourself, the pattern for the CAL starts here. If that page overwhelms, the actual instructions begin here. Max. He’s a trouble-making cat, how about that, he’ll chew up your houseplants in five seconds flat, then he’ll throw them up on your welcome mat, he’s nothing but a troublemaking cat. You can call me a foolish pet owner if you wish, but some times you just have to learn things the hard way. As you may recall, my cat Sketch was diagnosed with diabetes last fall, which necessitated the switch to a low carb, canned food diet. This change seemed to be working out well for both cats. But then a few weeks ago I noticed Max was eating less than usual. He would come into the kitchen and meow as if he wanted to be fed, but refused to eat more than a few nibbles of the food. It was almost as if he was eating the bare minimum just so he wouldn’t starve to death. My attitude was, “Well that’s your food now, so eat it.” So the stalemate continued. After a few days, or maybe it was a week, he began seeming lethargic most of the day and just slept a lot. Considering he is nearly fifteen years old, I began to worry his time with us was drawing to a close. So off to the vet we went…blood tests, urine tests, an abdomen ultrasound, a shot of anti-nausea drug, and an appetite stimulant pill. All the tests came up with nothing. So what did we learn? Apparently, a cat would rather starve itself than eat food it doesn’t like. Now that I’m tempting him with yummy non-low-carb dry food that I sneak to him while Sketch is out of the room, he’s eating more and is awake more. Cats. If they weren’t so adorable, soft and warm, I wouldn’t put up with this diva behavior. Ever had an animal refuse to eat because it didn’t like the food on offer? and sunlit days showing us how to tie knots. slips through the hole where you once were. I invented a couple of words for this brief poem, so those misspellings are deliberate. — bullseye to your center.